One year after the event that changed Lebanon, the assassination of former Prime Minister Rafik Hariri, more than 500,000 Lebanese came together on Martyrs' Square in the heart of Beirut to commemorate their fallen leader. Mr Hariri was killed in a huge blast on Valentine's Day. His death, blamed on Syria, plunged Lebanon into turmoil. The protesters were hoping to recapture the mood of last year's demonstrations in the aftermath of the assassination when hundreds of thousands people demonstrated against Syria. The rare show of unity was dubbed the Cedar Revolution in the West - the Lebanese called it the Uprising for Independence. But it has been a difficult year for Lebanon, with more violence and political divisions that left the Lebanese disillusioned with their leaders. The organisers of the commemoration, Mr Hariri's allies, were not sure what to expect on Martyrs' Square. In the end, the turnout appeared to have exceeded their hopes. The crowds started gathering in the early hours of Tuesday morning, wanting to make sure they would get a good spot in the gathering. Shops and schools were closed for the day, while the army and police were deployed in force. At 1250, the organisers called for silence in the crowd as they recalled the last moments of Mr Hariri's life, leaving parliament, driving through the heart of the capital, down to the sea front in the hotel district where he met his death at 1255. At that minute, the church bells tolled and a siren wailed. The event was peaceful, but security concerns kept political leaders behind bullet proof glass. In the 12 months following Mr Hariri's assassination, several other anti-Syrian politicians and journalists have been targeted by car bombs. For the leaders of the anti-Syrian camp, this was an opportunity to recommit themselves to their uncompleted goals. There were virulent calls on Lebanon's pro-Syrian President Emile Lahoud to resign. The speakers also promised to put a final end to Syrian interference in Lebanon. But there were also harsh words for Syria's President, Bashar al-Assad. Druze leader Walid Jumblatt denounced Mr Assad as the "tyrant of Damascus". "Bashar the terrorist brought you and the Lebanese people will get rid of you," he said, addressing Mr Lahoud. The outburst against Syria will not help the already strained relations between the two countries. 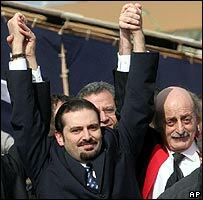 Saad Hariri, the son and political heir of Rafik Hariri, said allegiance to Lebanon had to come first. Mr Hariri, now the head of the parliamentary majority, has been living abroad for the last six months because of fears for his life. He returned to attend the commemoration and found that, despite all this time away, many Lebanese still saw him as a leader. In the crowds on Martyrs' Square, many of the protesters were screaming his name and asking God to protect him. Speaking to the BBC before the event, Saad Hariri said he had no doubt that the killers of his father would be brought to justice, adding he had full confidence in the UN investigation into the murder. The UN inquiry has been under way since the middle of last year and has already issued two interim reports in which it clearly implicates top Syrian and Lebanese officials. Led by German prosecutor Detlev Mehlis in the first six months, the inquiry is now headed by Serge Brammertz, a Belgian judge. The UN has been seeking to speak to the Syrian president but has failed to meet him so far. The UN commission has expressed the hope that the investigation might be concluded within the remaining six months of its mandate. Many demonstrators held up placards with the word Truth on it - the truth about who killed one of Lebanon's most powerful politicians is a demand that has brought many Lebanese together. But not all the political parties took part in the commemoration of the assassination. Some criticised it for being too politicised and pro-Syrian parties also stayed away, underlying the divisions that plague Lebanon and continually threaten to shatter its fragile peace.